More than two decades ago, then-33-year-old Dan Price had a wife, two small children, a high-interest mortgage, and a stressful job as a photojournalist in Kentucky. He worried daily about money and the workaday grind. Then he learned about what he calls “the simple life.” Price read Payne Hollow, a 1974 book about author Harlan Hubbard’s rejection of modernity and his primitive home on the shore of the Ohio River. Price’s marriage dissolved soon after, and the whole family moved to Oregon, where he grew up. 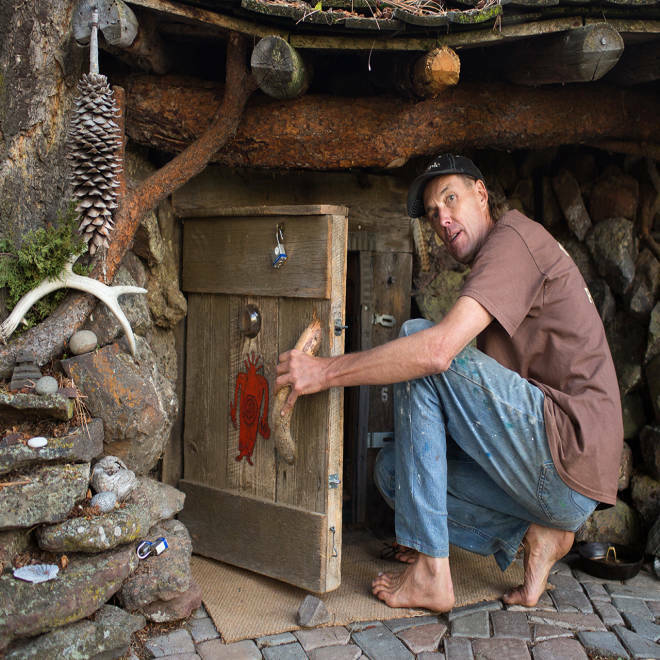 Price opted to move alone into a tiny cabin in the woods, then a flophouse, then a teepee, and finally into an underground “Hobbit hole” on a horse pasture near a river, where he still lives. During the winter, he decamps to Hawaii to surf and avoid the harsh weather. Price is part of a long tradition of eschewing the American dream of a house with a white-picket fence, from 1920s hobos to 1960s hippies. Nowadays, groups going back-to-basics are just as diverse, such as live-off-the-land types like Price, punky street kids, and twentysomethings living in modest group homes known as intentional communities. But they all have something in common: They’ve chosen poverty. Some, like Price, have lived this way for decades. For others, it’s a decision spurred by the recession and its exposure of economic precarity. Either way, it’s often a political choice, one that questions a consumerist, deeply stratified society. The intentional poor are “looking for something real that goes beyond commodity,” said Karen Halnon, a sociology professor at Pennsylvania State University and author of "Consumption of Inequality." Dan Price talks about why he's chosen to consume less and embrace a simple lifestyle with an income below the poverty line. Dan Kerr, now an assistant professor at American University, lived as a squatter 20 years ago in Manhattan’s Lower East Side and says the lifestyle was a way to challenge the notion that “the one-family home with a 9-to-5 job” was “the only way to provide meaning to our lives." At Sycamore House, an intentional community in Harrisburg, Pa., young people volunteer with nonprofits in exchange for food, rent, and a $400 monthly stipend. Emmy Corey, the program’s director, said that a third of residents signed up after struggling to find work after college. “Doing this has offered more security than the job market,” she said. Of course, no matter how bad the job market is, there are clear distinctions between those who have the privilege to opt for poverty and those who are poor through no choice of their own. If things get rough, Price has a career to fall back on. Banjo can return to his childhood bedroom, where he stayed before hitting the road. Corey’s young charges aren’t stuck in high-crime neighborhoods with subpar schools and services like most of America’s poor. And people who choose poverty are often free to make exceptions; despite his otherwise modest lifestyle, Price pays $53 a month for a cell phone and owns both an iPad and a MacBook Air. The demographics of these two groups are also starkly different: The pockets of people who choose poverty are nearly all white, experts say, while around half of the impoverished in the U.S. are black and Hispanic. For people involuntarily living on four figures a year, upward mobility would be a gift, not a trap. “Those people know that if they gave everything up, it wouldn’t be so easy to get it back,” said Kerr. Many have trouble understanding why privileged people would turn their nose up at creature comforts, “especially if you grew up yearning for these things,” said Halnon. Sometimes, though, intentional poverty isn’t a rejection of mainstream success so much as a deliberate means to it. 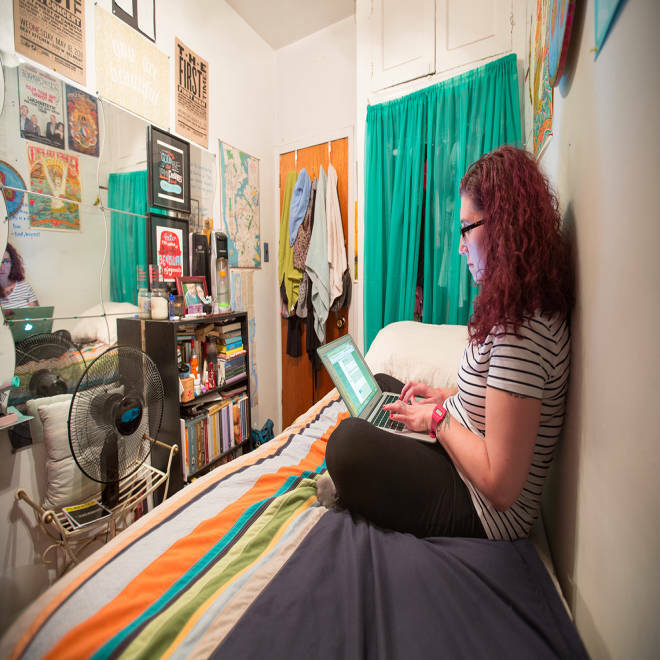 Amy Hayden sits in the room she rents for $135 per week in Manhattan's Washington Heights neighborhood. Utilities are included, but when her landlord said air conditioning would cost her an extra $5 per week, Hayden instead bought the fan at left on Craigslist. After being laid off twice from journalism jobs in Chicago, Amy Hayden, 40, moved to New York City last year with $50 in the bank and a dream of working in publishing. She was inspired by reading the memoir Just Kids by singer Patti Smith, who arrived penniless in New York in the late sixties determined to make it as an artist. While Price vows to live simply until he dies, Hayden expects to do this for no more than three years. Kerr, too, abandoned the squatter life for graduate school, and eventually, a stable university job -- studying voluntary homelessness.